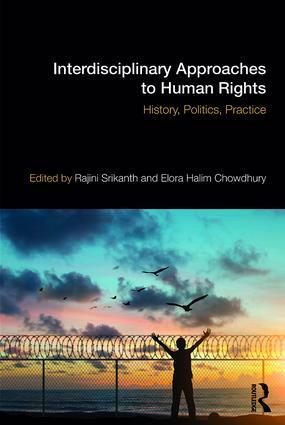 Interdisciplinary Approaches to Human Rights: History, Politics, Practice is an edited collection that brings together analyses of human rights work from multiple disciplines. Within the academic sphere, this book will garner interest from scholars who are invested in human rights as a field of study, as well as those who research, and are engaged in, the praxis of human rights. Referring to the historical and cross-cultural study of human rights, the volume engages with disciplinary debates in political philosophy, gender and women’s studies, Global South/Third World studies, international relations, psychology, and anthropology. At the same time, the authors employ diverse methodologies including oral history, theoretical and discourse analysis, ethnography, and literary and cinema studies. Within the field of human rights studies, this book attends to the critical academic gap on interdisciplinary and praxis-based approaches to the field, as opposed to a predominantly legalistic focus, drawing from case studies from a wide range of contexts in the Global South, including Bangladesh, Colombia, Haiti, India, Mexico, Palestine, and Sudan, as well as from Australia and the United States in the Global North. For students who will go on to become researchers, practitioners, policy makers, and activists, this collection of essays will demonstrate the multifaceted landscape of human rights and the multiple forces (philosophical, political, cultural, economic, historical) that affect it. Chapter 13: So, You Want to Work in Human Rights? Rajini Srikanth is Professor of English and Dean of the Honors College at the University of Massachusetts Boston, USA. Her research interests include the intersection between literature and human rights, post-apartheid South Africa, comparative race and ethnic studies, and Asian American literature. Her recent publications include Constructing the Enemy: Empathy/Antipathy in US Literature and Law (2012) and The Cambridge History of Asian American Literature (2016). Elora Halim Chowdhury is Professor and Chair of Women’s, Gender and Sexuality Studies at the University of Massachusetts Boston, USA. Her research interests include transnational feminisms, film and culture, and human rights narrative with an emphasis on South Asia. Her recent publications include Transnationalism Reversed: Women Organizing against Gendered Violence in Bangladesh (2011) and Dissident Friendships: Feminism, Imperialism and Transnational Solidarity (2016).